My debut in the jumper ring with Simon is just a few days away! Squeeeeeeeeee! Naturally, part of the reason I’m excited is because I get to wear all the fun tack. That is a reason for celebration… not stressing about late leads, super bonus! Plus, I didn’t want to go drop a bunch of money on unnecessary tack. If I stick to the jumper ring I have some needs that I’ll be trying to acquire (first on that list – open front boots!) but for one show he’s just fine in his hunter stuff. Still, I wanted to be spiffy… so I decided to spruce up some of my old items. 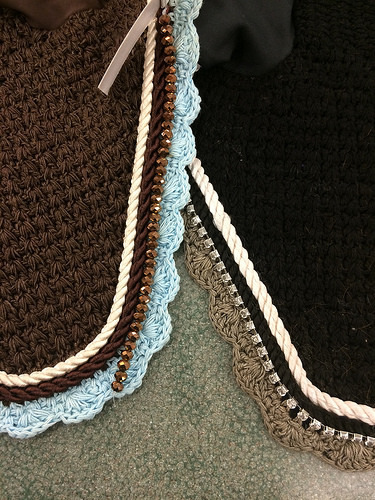 First off I picked up my “show saddle pads” and got some new embroidery done at a local place. My monogram on one, and Simon’s show name on the other. No picture because embroidery place took forever, but that’s a different story. Next up I selected my (matching) bonnets and decided I wanted to add some bling to them. 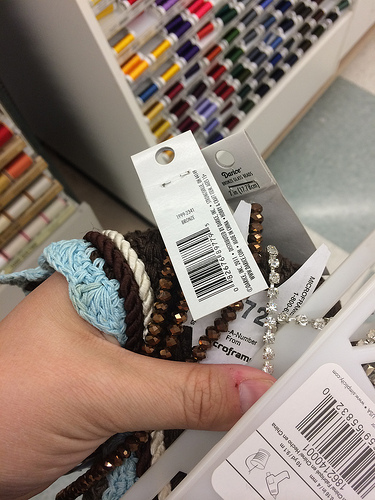 Gleefully I headed to the craft store to pick out supplies. And then after a lazy Friday night in front of television, I had my sparkly bonnets. 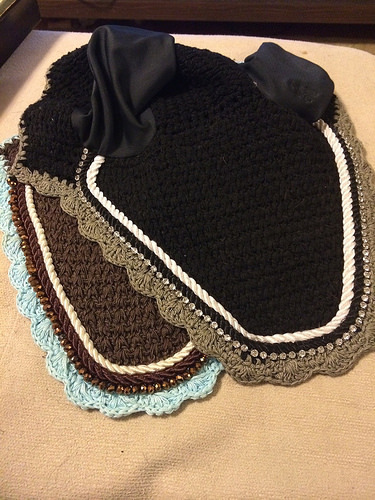 Maybe not fancy custom De La Coeur, but for $20 worth of supplies and $20 for each bonnet, I think they look pretty good! 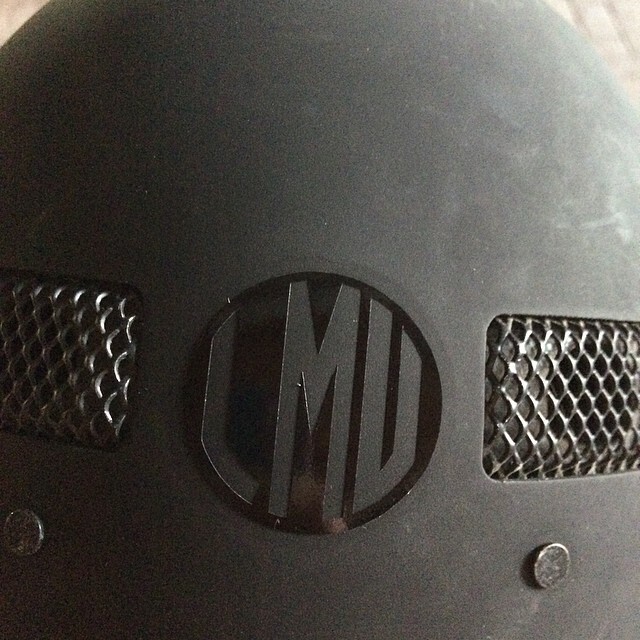 Finally I wanted to give my helmet some pizazz with the fabulously popular monograms from Personally Preppy. I also got a monogram for my breeches too… just need to iron it on! While these little purchases don’t have quite the pop that a new pair of Equifit boots would… I didn’t break the bank and I have a special collection of improved items to give me a little confidence in the jumper ring this weekend! I love the monogram and the new sparkle for Simon’s bonnets! You are all ready for the jumpers 🙂 Have a fabulous time!! Oh my goodness, I LOVE the bonnets! Great job on the bonnets! Where did you put the monogram? On the top….interested in seeing the whole thing! Those bonnets look SO good! And the monogram is really classy…. not too in-your-face. Have so much fun in the jumpers! I’m pretty adverse to monograms/sparkles, etc. The most I’m probably willing to do is a nameplate for my saddles 🙂 That being said, those fly bonnets look amazing! I absolutely love the monogram on your helmet! Slightly jealous that my helmet isn’t matte finished so I can’t use that product. And your absolutely right. No one NEEDS the equifit boots, or the fancy shmancy hardware. I feel like thats something the HJ world forgets about, and we all get wrapped up in what we don’t have. I’m not sure which of us is more excited for your jumper debut – me or you. I like how the bonnets turned out! We’ve got a similar style happening, with the bonnets and the monogram. Oh so semi coordinated. Question though, what did you use to attach the bling to the bonnet? I had sewed them on with matching thread. The string of silver crystals were MUCH easier to sew than the string of copper beads. Great ideas! So excited for you and Simon! I love love love the bonnets. I wish I was that creative!!! Love this! The bonnets look amazing. You have so many talents. Cool ideas! I wish I could put a monogram on my CO! But the mesh would make it look stupid I think. I’m intrigued by the monogram for breeches though… I’d probably be nervous I would ruin my pants though. Yay for all the matchy, blingy, monogram things! Can’t wait to see the whole ensemble together! 3. Yay, yay, yay for all the custom, blingy, monogrammed things!!! AWESOME!!! Good luck! Love the bling on the bonnets! Personally Preppy is popping up everywhere! A couple of people on HGS were talking about it, and I just saw somebody posting about them on facebook. Makes me wish that I didn’t have a velvet-like helmet now. Okay, that is REALLY clever, the fresh trim on bonnets! It’s, like, the equestrian equivalent of what Victorian and Regency ladies did to make old dresses and hats look new, put new trim on them. That is SO awesome! I am totally going to swipe that idea. 😉 You are seriously clever, lady! Well, I totally just bought monogram stickers for both my jump stick and my dressage whip. 😉 Maybe they won’t go to Galway Downs with the barn next time! So cool! I love the look of the copper beads! Good luck for your first jumper show! !